Welcome to the Old Welland Canals Field Guide. 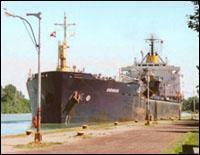 Most people living in the Niagara area are familiar with the Welland Canal. Running from Lake Ontario to Lake Erie its one of the largest canals in the world. What fewer people know is that the current Welland Canal is actually the fourth in a series of canals built between the two lakes. I created this website as a guide to these older canals and the landmarks that still exist along their routes. This site also contains histories, virtual tours, and a few hiking tips. Go exploring and maybe well run into each other. Have a question about the canals? Please post them on the Friends of the Welland Canal Facebook page. The group has over 400 members who enjoy discussing and answering questions people have about the canals. This website was written for local residents who want to learn about the canals. If you're not a local resident the following two maps show the location of the current Welland Canal. It's a good approximation of where these canals are located. Left: North America focused on the Great Lakes, a series of lakes located in the heart of North America. Right: The current Welland Canal shown connecting Lake Erie and Lake Ontario and bypassing Niagara Falls, a natural obstacle that prevented shipping between the lakes.